Photograph from Lambton Room collection. I had the opportunity to learn about one of Lambton County's most interesting and beloved preachers this week. Joseph Russell Little, popularly known as "Uncle Joe Little," roamed and preached in Warwick Township and beyond from 1833 to 1880. His eccentricities have become legendary in Lambton County, and time has mingled together truth and myth to create a fascinating portrait of a lovable preacher. Little's adventures began April 10, 1833, when he left his native Ireland at the age of 21 to manage the estate of Arthur J. Kingstone, a wealthy man from Mosstown, Ireland. Little managed Kingstone's estate for eleven years, until he was removed from his position because the estate was losing money (some say because Little's kind heart encouraged him to give away food and clothing to the poor; see p. 68, The Township of Warwick: A Story Through Time by the Warwick Township History Committee). In one of the worst career matches ever recorded, Little accepted the position of tax collector for Warwick Township. Again, Little's soft heart was ill-suited for his job demands; Little used his salary to pay the taxes of the poor and eventually lost his farm for back taxes and debt. Annie Ross's piece, Uncle Joe Little, written for the Warwick Women's Institute in September 1954, claimed, "His kindness of heart would not let him collect the taxes from the poor... he was often imposed upon." 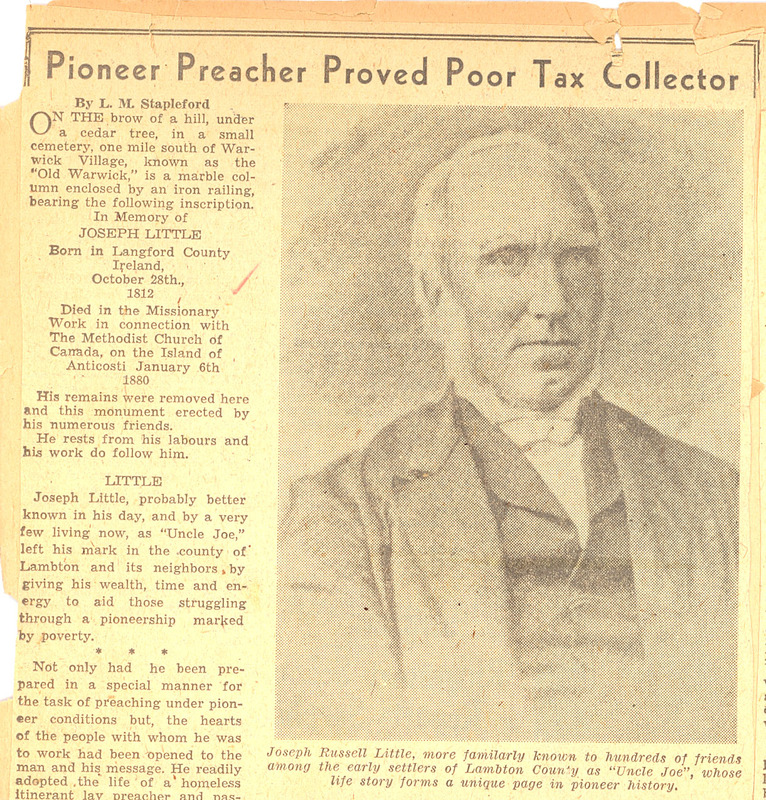 Little's loss became Lambton County's gain, as this financial blow left the preacher with little choice but to roam the countryside spreading the gospel. He traveled with his faithful steed Toby (the name given to his horse - or, as some historians maintain, the series of horses he rode around the county). 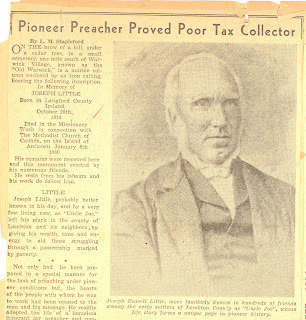 A London Free Press article from April 22, 1939 ("'Bishop of Warwick' Claimed His Horse Knew the Sinners") notes, "[Little] maintained that Toby would stop for every sinner in Lambton County. Toby stopped every time he met anyone. This was widely known and became a cheerful joke with Uncle Joe. 'Ah, another sinner, eh Toby,' he would explain as the horse stopped." 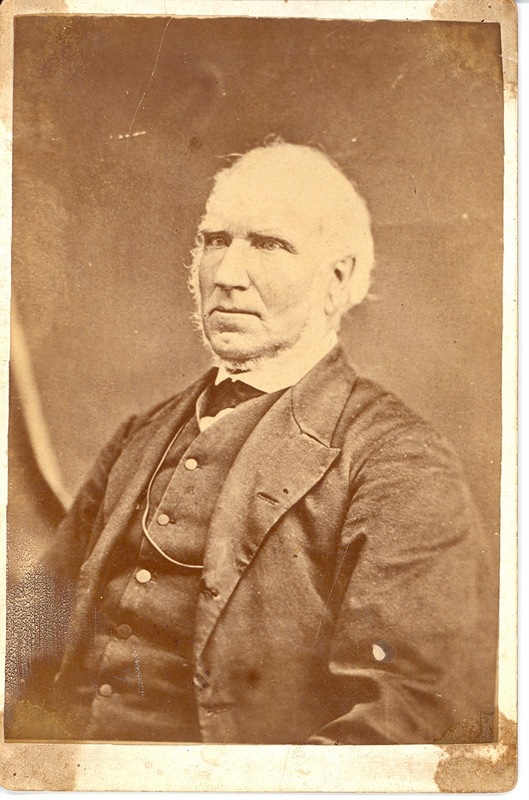 Little's wandering sermons and visits were fondly remembered by the Lambton families he touched during his travels. In her article "Monument Recalls Circuit Rider," Margaret Blais recalled the following story from her great-aunt Susan Howland: "Aunt Susan remembers when she was a little girl that he would often visit their home. Long before he reached their house they could hear his great Irish voice rollicking hymns. He would twirl his hat in the air and then greet them with a good Irish greeting. 'The top of the morning to you!'" One of the most significant resources we have for learning about the life of Little is Rev. Leonard Bartlett's "Uncle Joe Little:" Life and Memoirs of Joseph Russell Little, published in 1903. Bartlett tells Little's life story with the help of vignettes illustrating how Little interacted with his fellow man. Bartlett relates the following meeting on page 155: "A great temperance meeting was being held in the Methodist church at Sarnia. Early in the meeting the chairman called for Rev. Mr. Little... [Little said,] 'Friends, I am just a fish out of water. Why? Well, up here among all these black coats I feel out of place. My place is away out there among the backwoods of Warwick.' And then he went on and gave them a rousing temperance speech, such a speech as only he could give." Little was disinclined to write about his wanderings; his friend Mrs. W.H. Shaw asserted, "He was not a man that ever put on paper a mite of either speech or sermon, and when away he was a very poor correspondent." So, having never met the famed preacher and without written testimony from Little himself, Bartlett recreates words and countenance from stories and memories that reverberated around Lambton County at the turn of the twentieth century. Sometimes there is a tendency to exaggerate characters like Uncle Joe Little, who become larger than life as the years go by, and Bartlett's recreations of Little's life should always be taken with a grain of salt. What we do know for certain is that Little traveled to Anticosti Island to preach in 1879, and passed away January 6, 1880 from a longtime illness. When the people of Warwick got the news of his death, they instituted a Joseph Little Memorial Fund and raised enough money to purchase a coffin and ship the preacher's body to Montreal by boat and on to Warwick by rail. 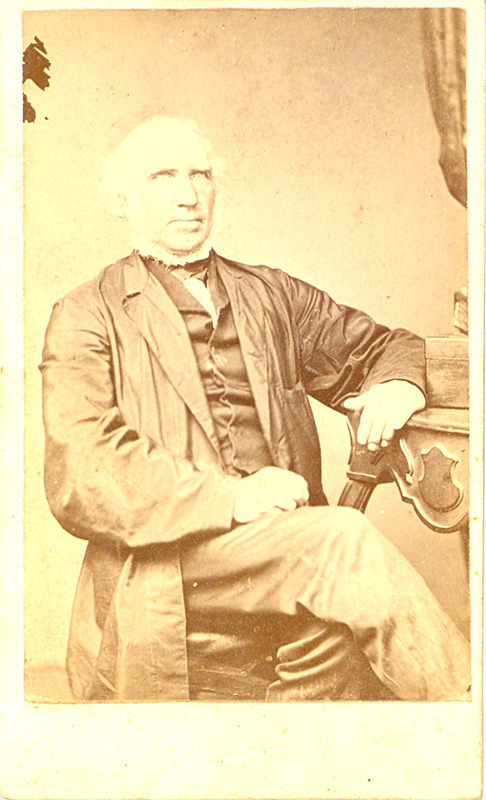 He was interned in the Warwick Methodist Cemetery (present United Church Cemetery) in November, 1880. His funeral procession stretched seven miles from Watford to Warwick, and over six thousand people came to show their respects. While we may not be able to verify every folk tale told about Uncle Joe's exploits, we can testify to the love and devotion he earned from the people of Lambton County as evident by his grand burial and the way his story has been fondly remembered and retold years later.